One of our enterprising Australian beaders has begun a series of design challenges. These challenges are run through a Facebook page called Australian Beaders. The challenges are run very similar to the Design Quests that I enter except that a focal piece is included that must be used. 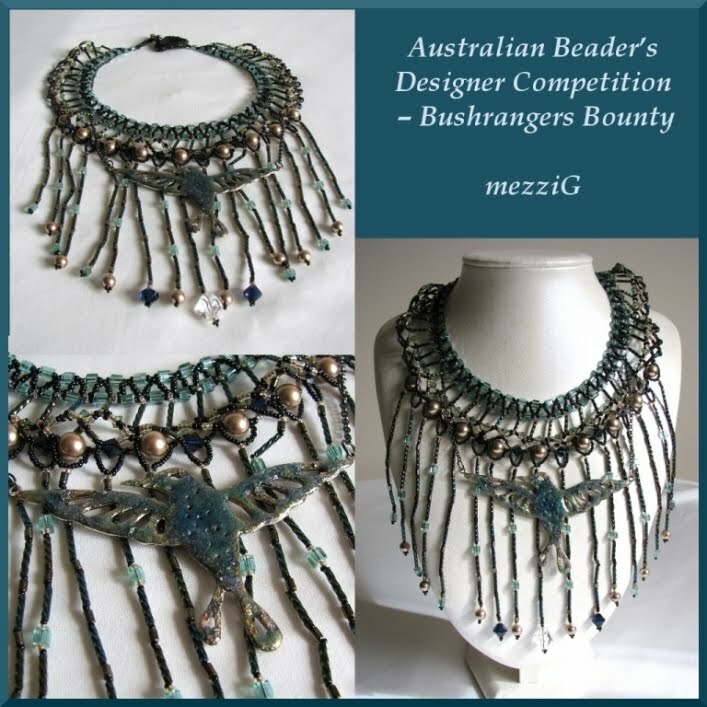 This first challenge was named 'Bushranger's Bounty'. The focal was a Hummingbird. Here is what I came up with. Beautiful beads as you can see. The focal began life as silver but I didn't like it at all and set about covering it up. I put a layer of Faux Dichro Liquid Glass and stuck copper/gold foil to it that I had left over from my card making days. I put around three layers of the foil on. It looked messy and bumpy and so I looked through my stash and found some gold coloured dry gouache. I sprinkled that on the top layer Liquid Glass and let it dry again. (The Faux Dichro takes a few hours to dry so I added a new layer every couple of days) When I came back to look the bird was no longer gold but blue! Not quite sure how that happened. Perhaps it reacted with the liquid or maybe somehow the dye in the cutting process had joined into the fun I don't know. Luckily the colour matched beautifully with the other beads. Don't you love it when complete accidents end up helping you out. As for the design. That came about as my designs often do. I started playing and then decided if I'd keep it or not. I began with the green squares and black seed beads and worked out a simple weave. Underneath that diamond weave I added a frill so that I could use the pearls and swarovski beads. After that I needed a background for the bird and still had some beads left over so I added some fringing. I like some aspects of the necklace and am not so fussed about others. How cool is it that I won. WOW! Congratulations! How fun to read about your process, and it looks like a winner to me. So glad to make your aquaintance through Creative Bloggers. I want to read your blog a bit more before I write about it. There's alot there!